So.....I have a new blog design! I'm in love with my new colors :) I wanted to have a little giveaway to celebrate.....I am giving these pencil packs to my students for their holiday gift this year. 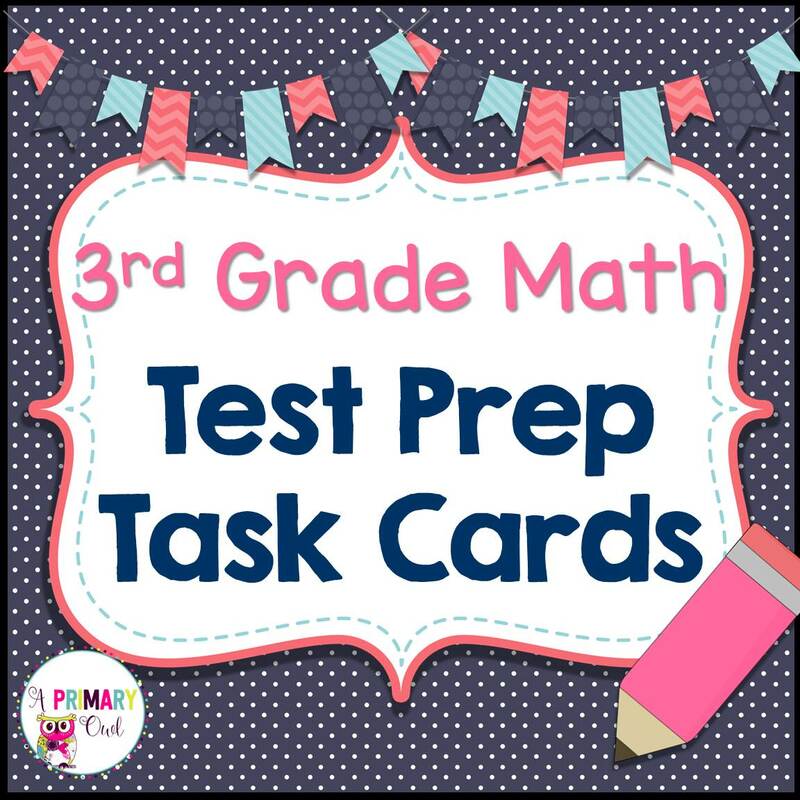 Now you have a chance to win a set for your class too! Hopefully this will solve the "I don't have a pencil" problem for at least a few weeks. Maybe?? I did a great math lesson, completely on the fly. 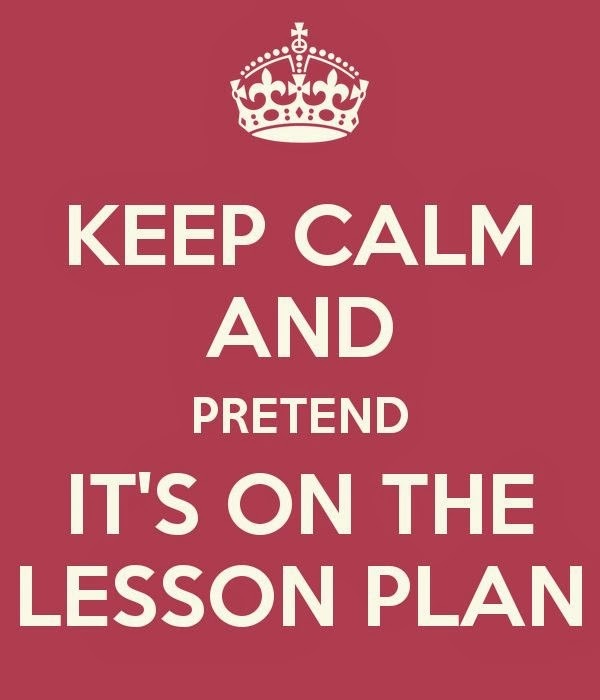 Sometimes my best lessons are planned last minute! Anyway, our last day before Thanksgiving break was Friday and on Thursday night I happened to be walking through Kroger and saw stacks of their ads sitting by the door. 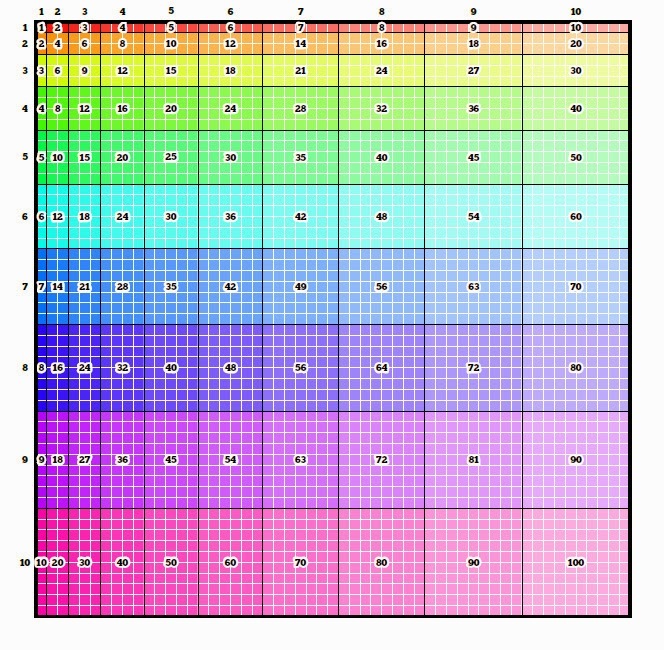 So I went home and whipped up a quick worksheet and it went great. They used the calculator on their devices to help with them, but they had to decide whether to multiply, divide or add to find the correct answer. The conversations about the price of the things were hilarious, "Man, turkey's are expensive!". On the back they had to spend $20.00 for a Thanksgiving meal. If you still have school on Monday and Tuesday, you can grab a copy of it here. Edit it to match your local store ad :) Happy Thanksgiving! I was inspired this week by a Pinterest picture I saw. This mom has a great website called lemon lime adventures. (She must be an amazing momma!) She gave her kids candy pumpkins and did some STEM and science experiments. Which reminded me of something my daughter did in her 6th grade STEM class. 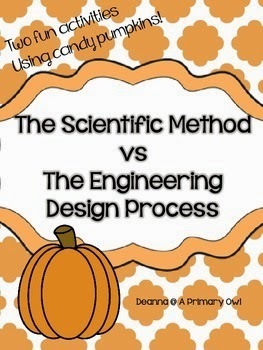 They compared The Scientific Process with The Engineering Design Process.......so bam! The idea hit me! Let's do that with the candy pumpkins. So I created two experiments, one is a STEM project with the pumpkins where they have to build a tower and the other is a science experiment where they have to put the pumpkins in four different liquids. After both experiments are over, we will compare/contrast the two processes. 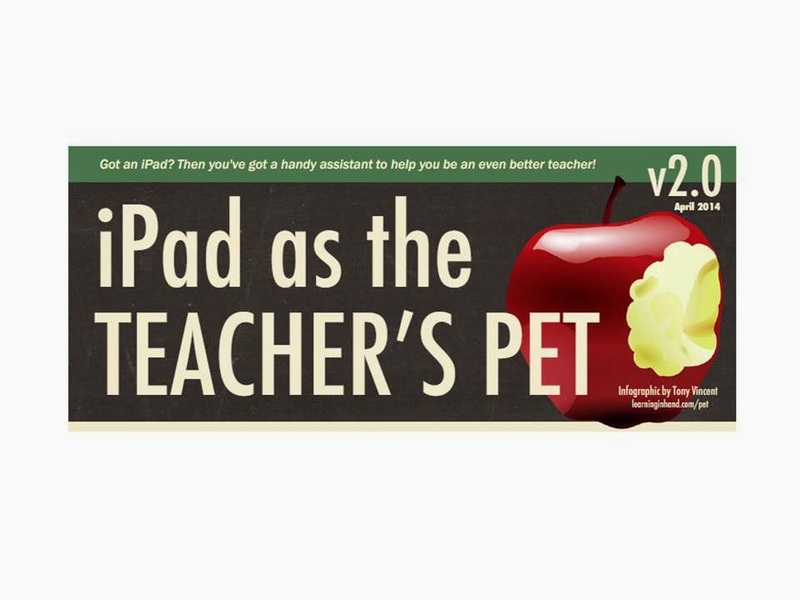 This should be VERY interesting as I only have third graders! If you would like to try it, you can get your copy here. The best thing is.....Halloween candy will be on sale after next week and this is not a Halloween project! I am planning on doing this on Friday, hoping that by doing something fun it will help them from being too wild and crazy since it is Halloween. What are you going to do on Halloween? What are your survival tactics to get through the day? 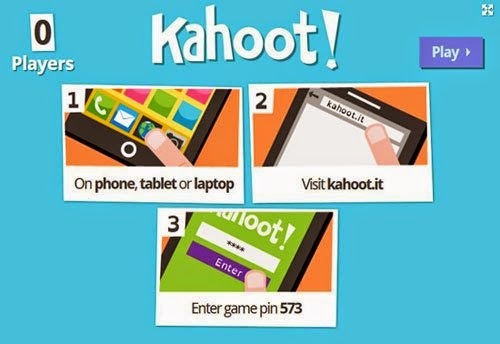 The teacher adds questions to Kahoot, to make a game prior to the class session. I use it as a review for an upcoming test. 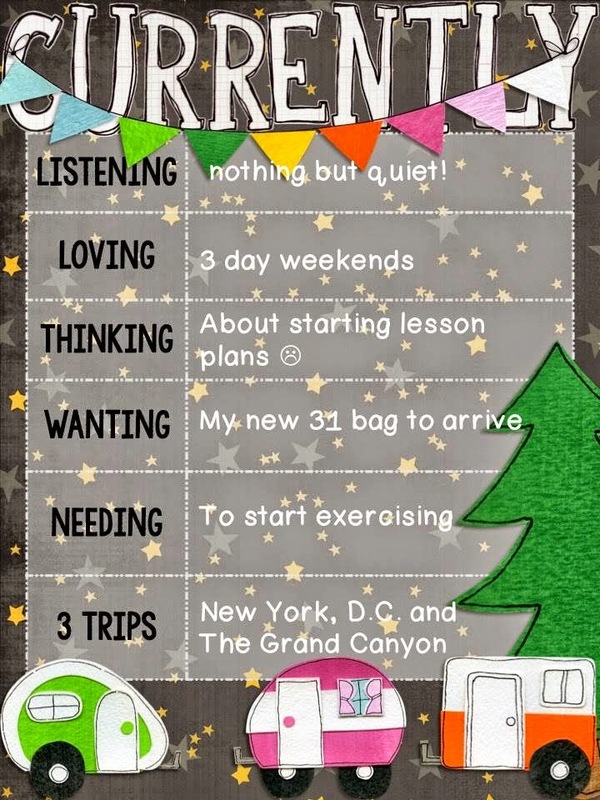 The students then can use the app to enter the game using a "Game Pin" or they can log on via the website. I love that there are two options because not all my students have downloaded the app on their device. They then answer the questions "real time", see the correct answers and then see who in in first place, etc. My students get so excited! They are so engaged. 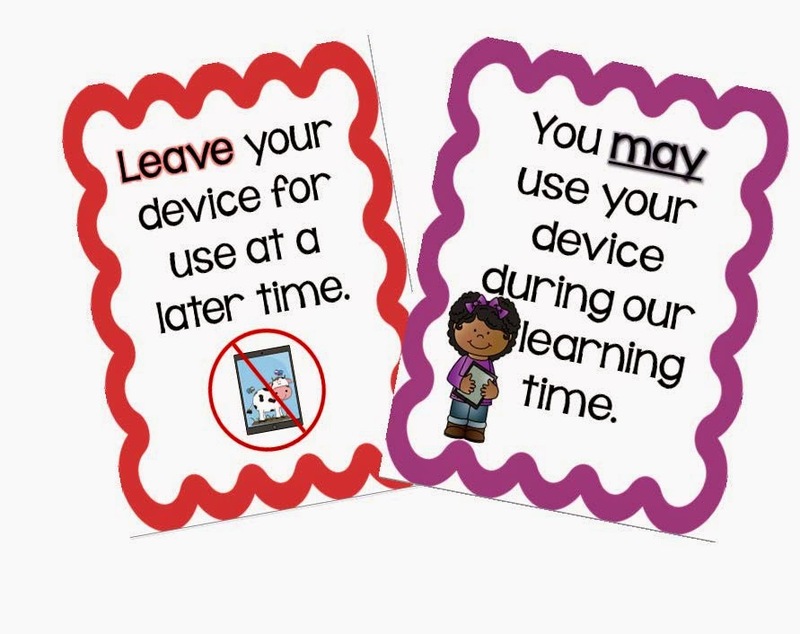 Also, if you don't have devices for each student you can easily have them work in teams with several students sharing a tablet or computer. 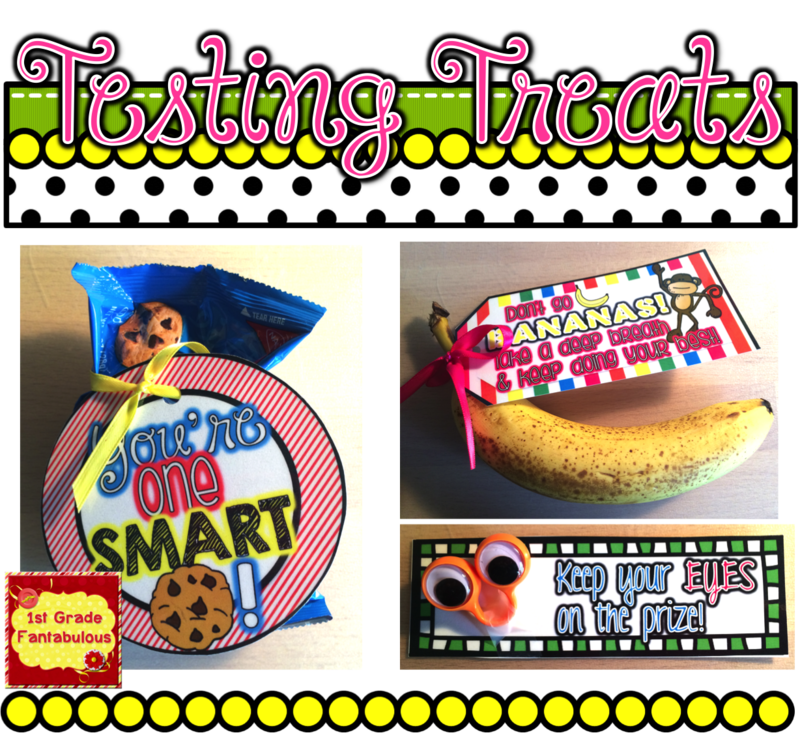 Last week I entered questions for our upcoming Science test, the lowest grade on the test was a "C". How I can argue with results like that? Plus they love it! I can't wait to start using some of the ideas I went away with! 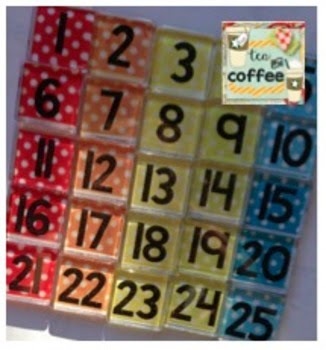 I found these magnets last year on tpt and ordered a set for my Daily Five choice board. 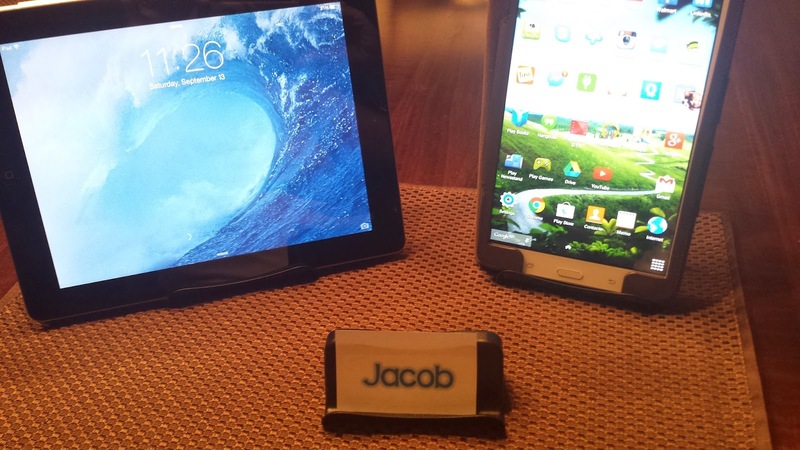 I was frustrated because regular magnets do not stick to anything that is laminated! Especially with hot glue. These magnets saved my day! 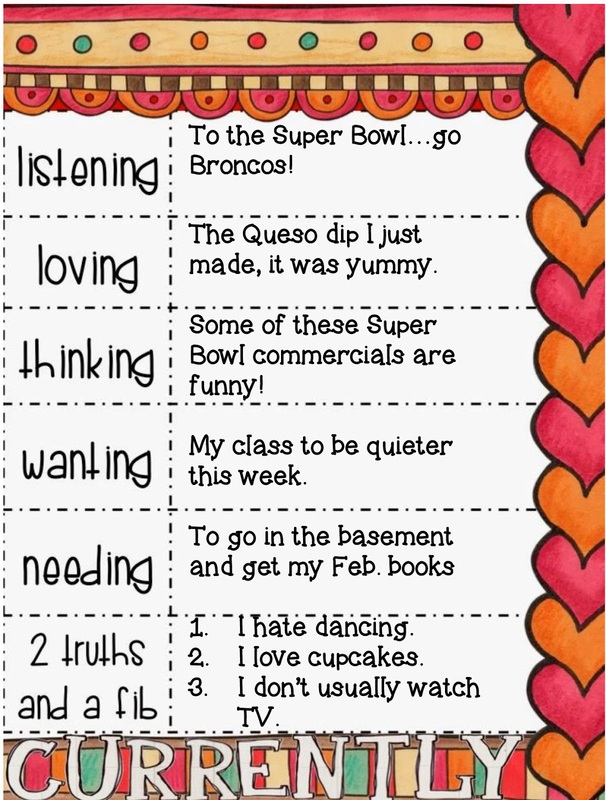 Here is a little snapshot of my Daily Five choices and the student's magnets on their choices. It worked out so well, I went back to the ladies at tea and coffee and ordered another set for my library rotations. No more "Can I go to the library?" All they do is move their magnets when they are ready to go to the media center. So this year, I was completely freaked out by the fact that I had 29 students! I only had 25 magnets. 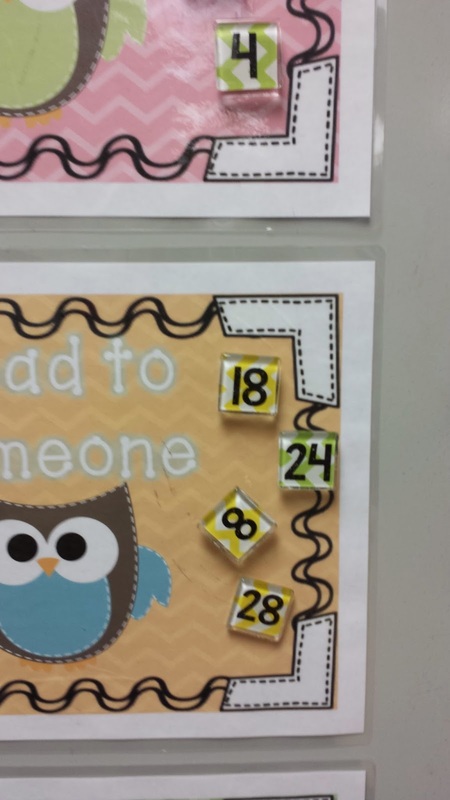 I emailed the ladies at tea and coffee and they matched up my magnet sets and and mailed the rest of the numbers I needed! 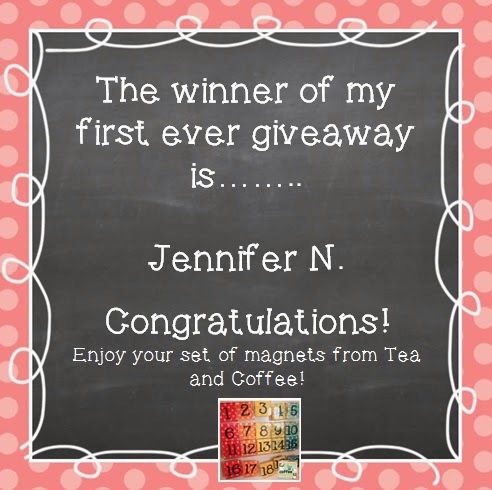 That's when I had the wonderful idea to give a set away to one lucky person. They are coming out with some really cute new designs too and they can design anything you want........so enter maybe you can get a free set! I would love to see how you use them. I decided to take the summer off and get some much needed rest and relaxation. It was a GREAT summer, and then when school started it has taken me a good month to get my feet under me and feel like I've got a handle on what I am doing! I am still in third this year so at least I did not change grade levels, but I was made grade chair. And I've revamped a bunch of things in my room this year. Many things that were on my list last year, that I just didn't get around to. 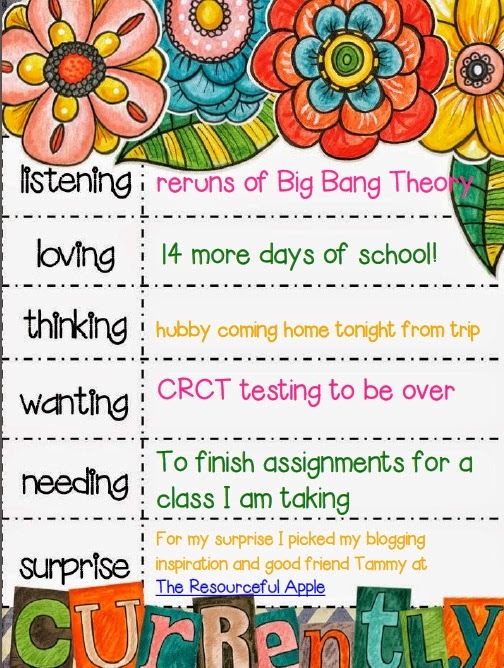 One of the biggest things I have started this year is that I have ditched the clip chart! 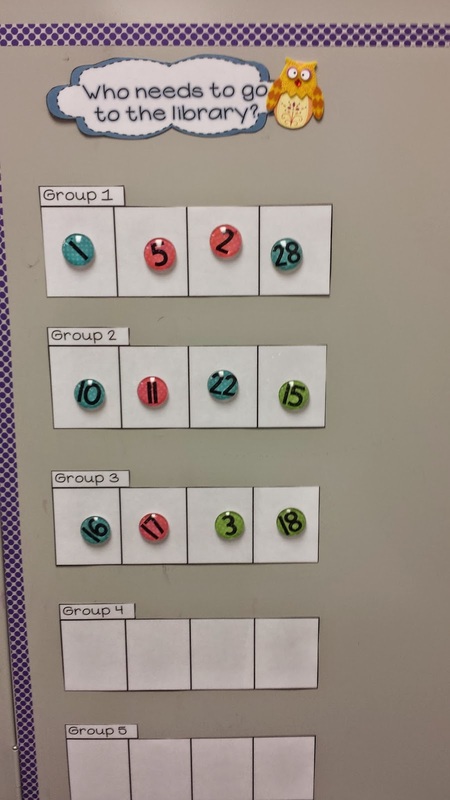 I read a bunch of great blog posts and articles about how clip charts don't really change inappropriate behaviors in problem students and it's humiliating for children to be "called out" in front of their peers. So my school is pushing Class Dojo this year and I hopped on board. 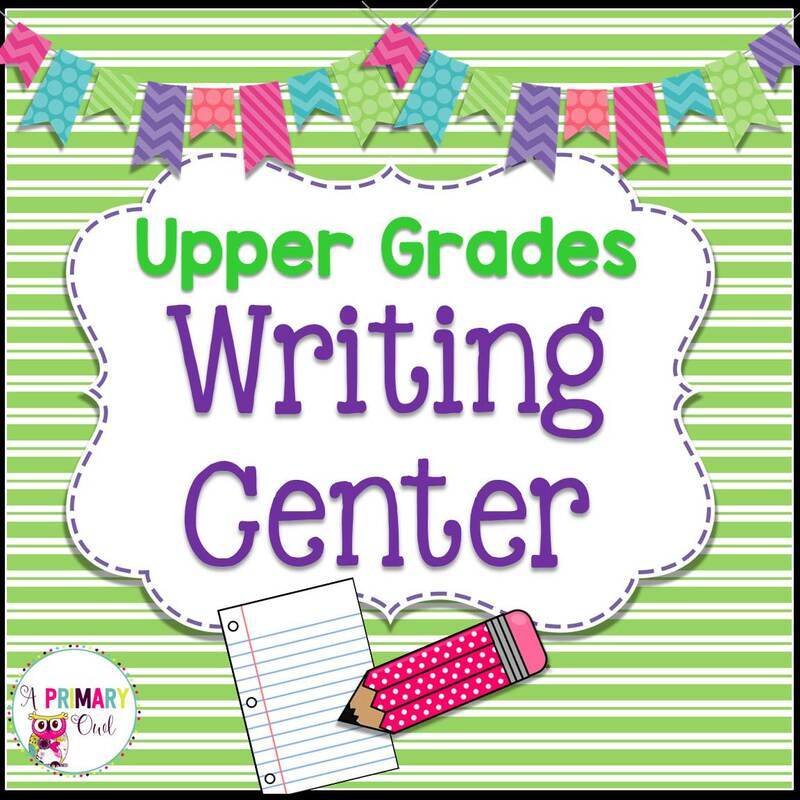 It really is very user friendly to customize for your class. It makes you remember to see the good things they are doing and even if they get points taken away, they are always able to earn points back. I was able to get all my parents to sign up to check their child's points (amazing) and the parents can send you messages. I like this because I can see them on my phone, like a text message and I don't necessarily have to log on to my school email to respond. 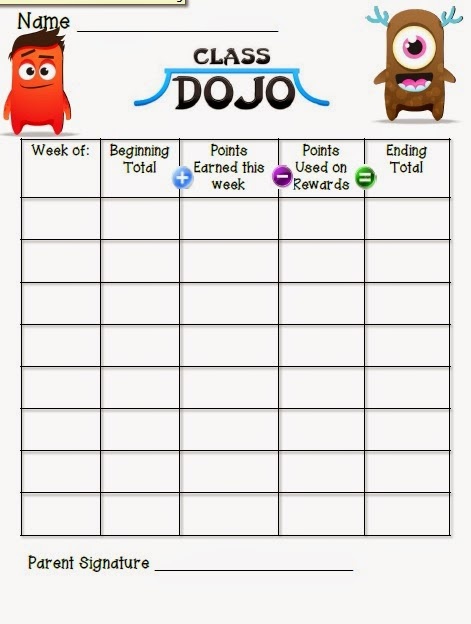 I am having my students turn in points on Fridays, since they don't always want to use all their points I made a points tracker sheet where they can add and subtract points on Fridays. 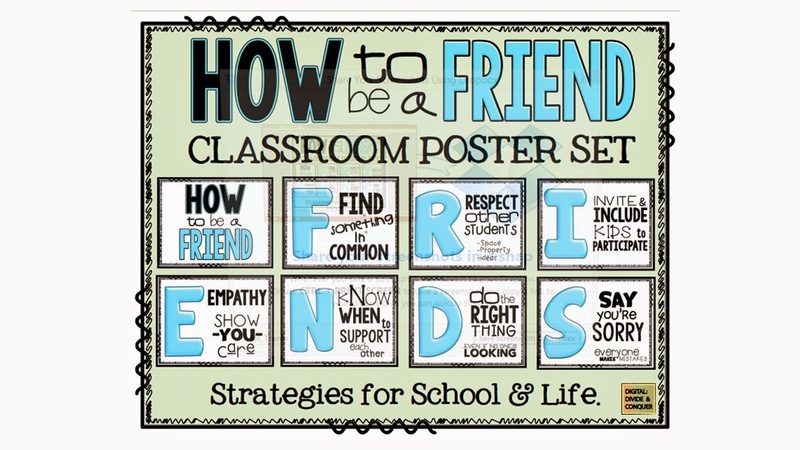 You can get this cute freebie on tpt here! My inspiration for my rewards was this amazing Pin on Pinterest! 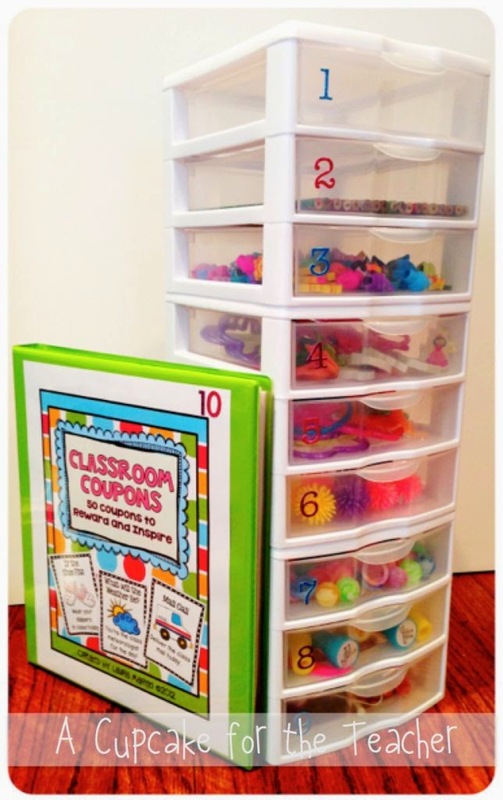 I loved this idea when I saw it and immediately bought her Coupon Binder on tpt. I just made my drawers match Dojo points and its working great. I have a few random things to share today! I know I have talked about close reads before but I have to share a great idea I had. 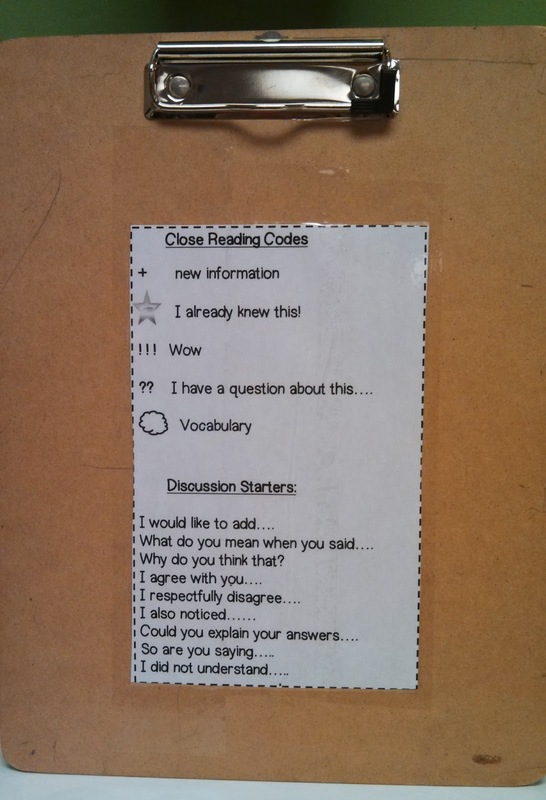 I had typed up the close reading codes and was having my students use them as bookmarks, which works ok. But you always have the student who looses everything! 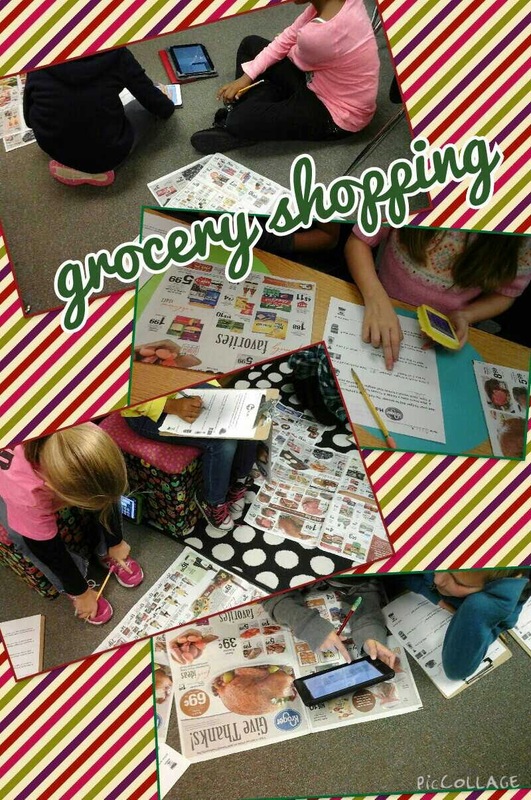 We usually do close reading at the floor with our clipboards holding the passage we are reading. That's where my great idea came in....I taped the codes to the clipboards with packing tape! They turned out super, now all they have to do is flip up the page to see the codes and they will not get lost! 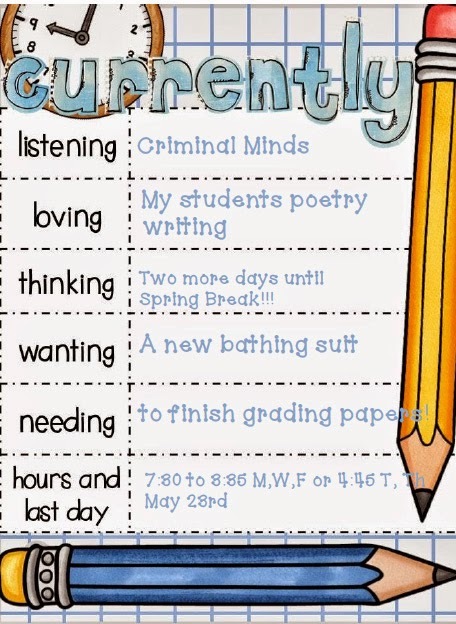 You can get a copy of my close reading codes here...it is a freebie! The next random thing I want to share are two amazing websites. Have you ever wanted to show your class a youtube video only to be a little embarrassed about the ads and other stuff around it? Plus if your class is anything like mine, they starting giving me "directions" on which video they want me to click next. This new website is a great way to share videos, minus all the other distractions. Go to Safe Share, copy your youtube link or any other video link and it gives you a safe url. Our district is starting to explore flipped classroom models and this would be a safe way to include a video link for your students on your website. 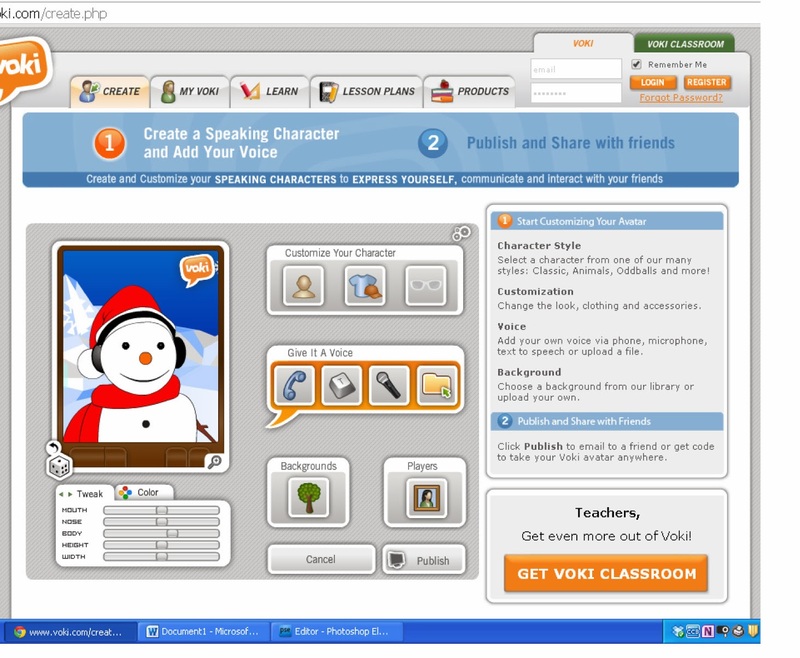 The next website is a super cool one....at Voki you can create or have your students create their own talking avatars! I love these...I especially love how you can type in the text and the avatar will speak it. You can even change the language and accent. It doesn't have a Southern one though and ya'll I was bummed about that! There are so many things you can do with this website and I have barely scratched the surface. You can even embed the avatar into power point presentations you make, how fun is that? 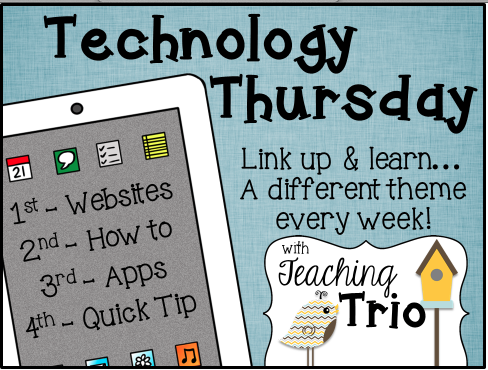 Hope you enjoy playing around with these websites and maybe they will turn out to be useful! It basically says, we are how we treat each other and nothing more. I love this song and we've been playing it to remind ourselves how to treat our classmates. I also do a kindness project, where we do Random Acts of Kindness throughout our school. Last year, I did the whole month of February! Way too ambitious, so this year we will go up until Feb. 14th. So here's to a great February! Listening: To the Super Bowl and not that I am a big fan of either of these teams, I do like Peyton Manning. So we were cheering for the Broncos, but its not looking so good at this point! Loving: I made that yummy queso with Velveeta and Rotel tomatoes. My family thought I was a rock star, they loved it! Thinking: Speaks for itself, the commercials during the Super Bowl are so funny. I especially love the Doritos and the time machine! 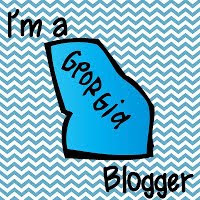 Wanting: My class was so talkative last week, we had two snow days which is not normal for the Metro Atlanta area! The snow just caused a big uproar! Needing: I go into my basement to pull books for our next month or upcoming units and I still need to get down there even though it's almost 8:00 on Sunday night! 2 Facts: I DO love cupcakes and I am not much of a dancer. I have never really loved going out dancing, I feel silly when I do. 1 Fib: I watch entirely too much TV, Downton Abbey is my newest obsession! Link up with Farley, if you haven't already! I came across this article today and loved it. 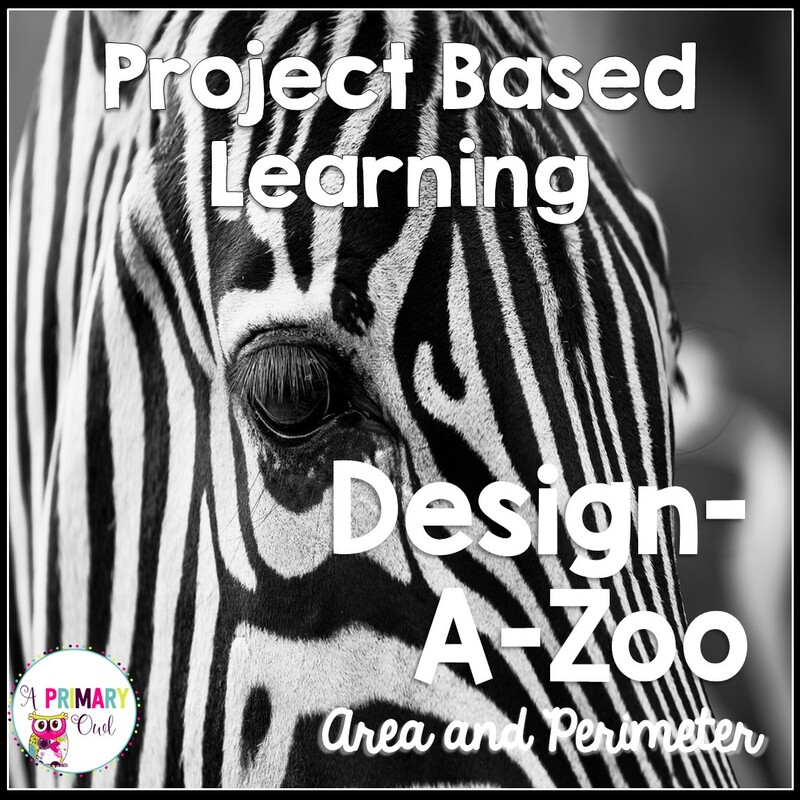 We really get caught up in standards, testing, laminating and lesson plans. But what is it that students remember? They remember that we cared. We listened and we helped them when they needed it. This was a great reminder for me to focus on what really matters, not the list of things we need to get done this day but focus on my students. Read it and feel better about what you are doing! 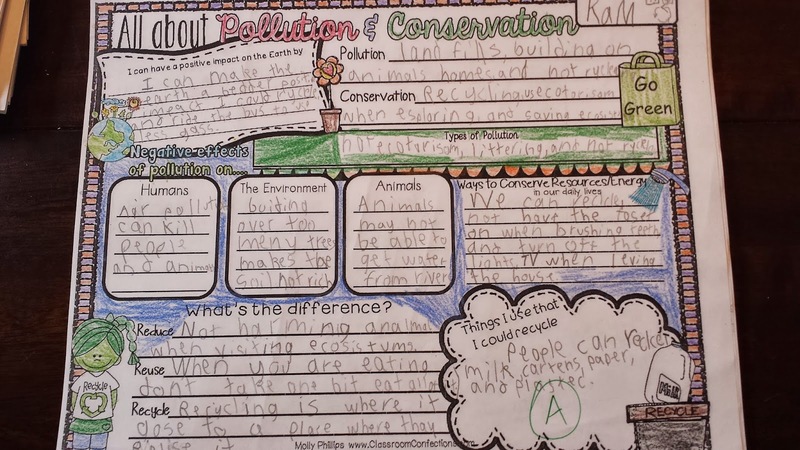 I admit I see those cute anchor charts on Pinterest and mine just never end up that cute, especially when I am writing as my students are responding or coming up with ideas. I have tried but never end up liking the way turn out. So I usually end up typing them and gluing them on chart paper as we discuss the topic. 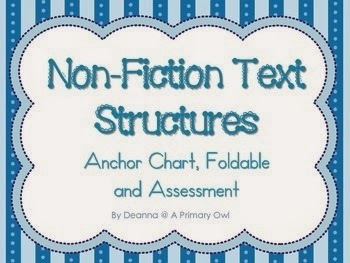 This week we were concentrating on Non-Fiction Text Structures. 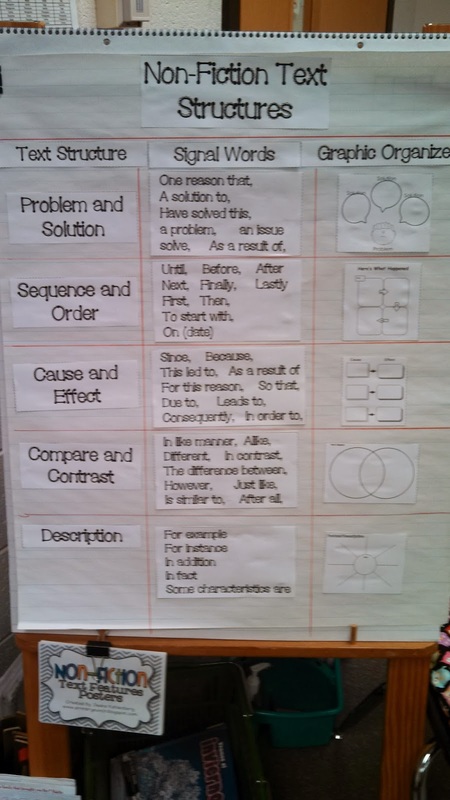 I made an anchor chart, a foldable and a quick assessment to go along with our discussion. I loved the way it turned out. I think I need to work on making more of these! Let's celebrate my new design!